For many farmers and ranchers, feeding the herd is an increasingly challenging and costly proposition. Successfully growing enough food in the traditional manner is dependent on numerous seasonal and environmental factors, and subject to drought, flooding, extreme temperatures and other natural disasters. Buying and having food shipped in from outside sources is expensive. Now there’s a consistent, sustainable, self-contained method of growing fresh forage for dairy cattle, performance horses, meat cattle and more thanks to an innovative concept from Kansas City, MO-based BioGen AG. The company is the creator of the patented Portable Feeding Platform, OR PFP. 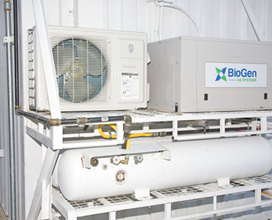 The PFP is a self-contained, internal bio-reactor housed in shipping containers and trailers that have been repurposed to grow fresh, organic forage. 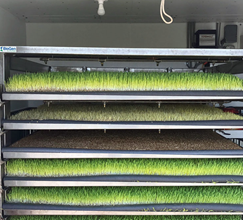 The unit can produce between 300 – 4000 pounds of fresh green forage daily using 95% less water than the amount required to grow the same amount traditionally. Furthermore, the unit uses no fertilizer or harmful pesticides, resulting in quality organic feed, healthier animals, and ultimately greater revenues. The fresh food produced by the units is less expensive and more nutritious than hay (forage that has died and dried out.). The PFP comes in three different sizes and is configurable for solar and wind power generation for off-grid operations. BioGen AG is the brainchild of Chad Schofield, a self-made entrepreneur who left home at 14, and became a pilot and fish buyer in Alaska. He returned to college, where he earned a scholarship, starting and eventually selling a successful East Coast tech company. Schofield moved to Kansas City, started his cattle farm, and soon became passionate about finding a better, more sustainable way to feed AG animals. The primary crop grown in the PFP is barley, but there are about 30 kinds of sprouting grasses that can also be grown there, according to Schofield. “The potential is much greater, as these units can grow everything from fruit and vegetables to hemp,” he says. Fresh forage on demand. 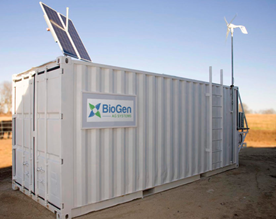 That’s the premise behind the new BioGen AG Portable Feeding Platform (PFP), a self-contained mobile unit that grows food for AG animals 24 hours a day, 365 days a year, regardless of season or weather. The PFP offers farmers and ranchers a sustainable, affordable alternative to growing food traditionally, or outsourcing. The fresh, organic, hydroponicallygrown food is healthier than hay.